Here on Life with Lynnie (LwL), I want to let you know what happened on what we Christians call... Good Friday. As you just read, Jesus paid the price for the sin of the world, for all who would believe upon Him, by giving His life on the cross. Jesus could have not given His life. 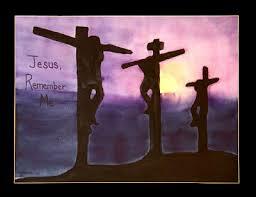 He could have not gone onto the cross and ended his earthly, physical life. But, He did. Jesus gave His physical life, but went back to be with God the Father. And, gave us the Holy Ghost/Holy Spirit. I have gained salvation and everlasting life by trusting in/believing upon our Lord, Jesus Christ. If you have not, then when your life ends here on earth, you will spend eternity in Hell, separated from God... with NO chance of escape. If you have, then I'll see you in Heaven once our lives here on earth, ended. And, together we will spend eternity with Him.